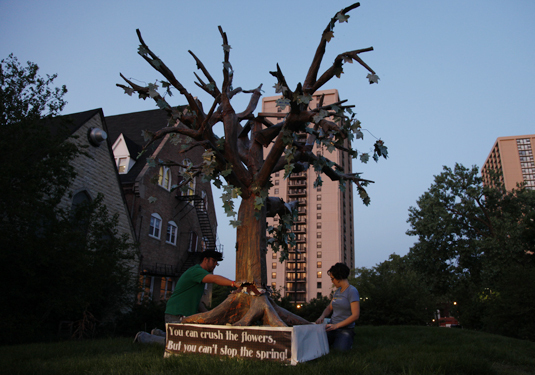 Members of Occupy Chicago’s Arts and Recreation Committee and Occupy Chicago Rebel Arts Collective installed their interactive public sculpture, Wishing Tree, Monday night at Trinity Episcopal Church, 125 East 26th St., blocks away from McCormick Place, the site of NATO summit that begins this weekend. It’s the fourth location for the tree, which took more than 200 hours to create. Kickstarter funded the public art project, and the goal is for people to write their wishes for the future on paper leaves and attach them to the tree’s branches. The Wishing Tree has been collecting wishes ever since its debut at Occupy Chicago’s kick-off for the Chicago Spring, April 7th, and will be up until the summit begins May 20.